Electrolytes, trace minerals, B vitamins and biotin for mineral replenishment, optimal hydration, sound healthy hooves, and a brilliant coat. A blend of naturally occurring electrolytes, trace minerals, B vitamins, and biotin to replenish & maintain mineral balance, hydration, sound healthy hooves, and a brilliant coat. "…he recovered at a rapid pace…"
Springtime Hoof & Coat Formula is a whole food formula made from natural, unrefined ingredients, rich in wide-spectrum trace minerals and electrolytes. Electrolyte balance is essential for sustaining life, as it powers such electrochemical processes as nutrient absorption, proper hydration, healthy muscle contraction, and digestion. Added biotin makes Springtime Hoof & Coat Formula specific for maintaining sound, healthy hooves and a brilliant coat. Directions: Feed one scoop (≈ 1½ oz.) per 1,000 lb. of body weight daily. administration of furosemide. Not recommended during pregnancy. Ingredients: kelp (ascophyllum nodosum), sea salt, nutritional yeast culture (saccharomyces cerevisiae), diatomaceous earth, biotin. For centuries people all over the world have harvested sea kelp for food. The Chinese, Irish, British, Icelanders, Canadians, Japanese, American Indians, Hawaiians, Koreans, Russians, Eskimos, and South Africans are just a few of the peoples who have traditionally eaten kelp. It has also been commonly used as a soil fertilizer and an animal feed. Without doubt, kelp is one of the most nutrient dense foods that exists. As it grows, sea kelp converts the inorganic minerals in sea water into organic mineral salts, which are combined with amino acids to form naturally chelated minerals. Although the quality of lab-made mineral supplements varies wildly, the minerals in kelp are always fully bound. Yeasts are distributed widely on plants (leaves, flowers, fruits), in soil, in and on insects and animals, and in fresh water. Thus, for millions of years, yeasts, one of nature's best vitamin foods, have enriched the natural diet of horses as well as other animals. For the past 40 years or so, as man realized the importance of this food, dried or mostly "spent" brewer's yeast was fed to horses and other domestic animals with good success. Live enzymes in Hoof & Coat Formula nutritional yeast culture (saccharomyces cerevisae) are retained by a special process which stabilizes the yeast without destroying its "live" properties. The sea salt used in Hoof & Coat Formula is obtained by the simple process of concentrating sea water under the sun. It contains all of the ocean's original trace elements. Up to 6% of Hoof & Coat Formula sea salt is composed of naturally occurring potassium, calcium, magnesium, and trace elements. It is of such a high grade that it can be dissolved in water to make true sea water that will support any type of marine life. Biotin is a well known nutrient for the support of healthy skin, coat, and hooves. Hoof & Coat Formula is a whole food formula made from natural, unrefined ingredients that are known to be especially rich in wide spectrum trace minerals. 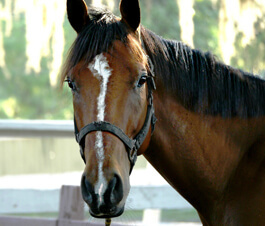 Use in place of ordinary mineral or electrolyte products which lack the wide spectrum nutrition of Hoof & Coat Formula. My black Percheron, Barak, is four years old and in very good health. I have been feeding him Bug Off Garlic for some time with great results. Last time I purchased enough to qualify for a free gift. I selected the Hoof & Coat Formula. He has completed one small jar. When my farrier arrived to trim his hooves he immediately began asking me what I had done to make his feet so strong and healthy. Percherons are bred for strong legs and hooves so I was surprised that one small jar of Hoof & Coat Formula could make such a noticeable difference with very good hooves. I gave my farrier the empty jar and a catalog as he plans to recommend it to his other clients. Thank you Springtime, for improving the quality of life for all four-legged friends. 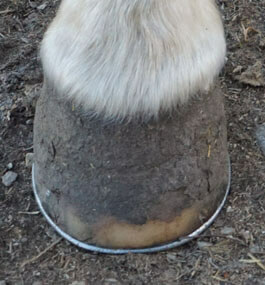 Before Hoof & Coat Formula, Sunny’s hoof had many bad cracks. 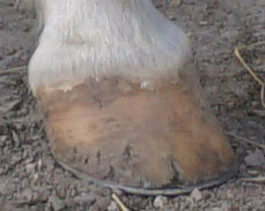 After using Hoof & Coat Formula, her hoof shows dramatic healing. Sunny and a few of her favorite friends. "… I noticed the crack in Sunny's hoof was shrinking!" My Quarter/Fox Trotter mare, Sunny, foundered about 3 years ago. I have fought with her feet constantly. Last year, the right front cracked, and I had lost my farrier. Her feet went without attention for almost 3 months as I located a farrier who had the expertise I wanted. In the meantime, I came across the Hoof & Coat Formula and began feeding it immediately. A month later, I noticed the crack in Sunny's hoof was shrinking! Not only was it reconnecting from the top but from the bottom as well! I could hardly wait for the farrier to come again. When he did, he too was amazed at the structural difference in her hoof. Sunny has now been on the Hoof & Coat Formula for approximately 7 months. At our last farrier appointment, my farrier declared her sound. In fact, he said that if he did not know she had foundered, he would be wondering if she had. Not only do her feet look better, but they are hard which is so great for white hooves (although muddy in the "after" photo, Sunny has white hooves). 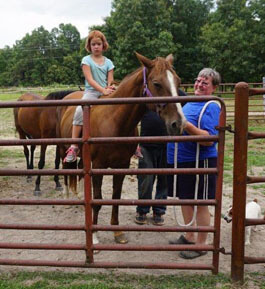 Hoof & Coat Formula has definitely helped support her healthy hooves. Both myself and my farrier give it full credit for my mare's feet health. Sunny will be on it for life. Sir G showing off his beautiful coat. 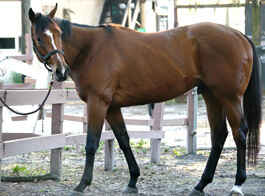 My 4 year old off the track Thoroughbred's registered name is 'Great Rezults' but I call him 'Sir G' or just plain 'G'. He was a throw away as he only raced 8 times in his young life and came in 1st just once. But his last two races this year in March and April, he came in 2nd! His ancestors are Man O' War, Native Dancer, and Unbridled is his Great Grandfather…his cousin is American Pharaoh! His knees are a little inflamed and can't handle the races anymore so his owner let him go. So for only $600, I have a beautiful 4 year old Thoroughbred with lots of life left in him and he's enjoying the 'retired' life! I have been using your Hoof & Coat Formula on Sir G for a little over a week now. He was suffering from rain rot. I had used a product which killed the rain rot, but his hair hadn't grown back in. However, this past week after I started on Hoof & Coat Formula, I noticed his hair has completely filled back in!!! WOW, that was FAST! And I'm pretty sure his 'delicate' hooves have strengthened as well. He has kept both of his shoes securely on the past 2 and 1/2 weeks (twice he's lost one prematurely). Today I noticed his hooves look really healthy, shiny, and strong and his hind hooves haven't started chipping away like they normally do after a couple of weeks. I can't wait until my farrier comes on October 12th to see how much Sir G's feet have improved! I moved him from a much too wet environment that was causing him to be very tender footed and making him basically lame. He also obtained an abscess from that place as well. After moving Sir G to his now high and dry beautiful home, it took a month for him to recover. But I just have to say that this past week after starting him on the Hoof & Coat Formula, he recovered at a rapid pace from both the rain rot AND his soft, water damaged hooves. Thank you, Springtime for a wonderful product!!! I will send you an update to let you know what my farrier thinks. I'm sure he will be very pleased!